Barings Bank was a British merchant bank based in London, and the world's second oldest merchant bank (after Berenberg Bank). It was founded in 1762 by Francis Baring, a British-born member of the German-British Baring family of merchants and bankers. (Purchased for £1 by ING). The bank collapsed in 1995 after suffering losses of £827 million (£1.6 billion today) resulting from fraudulent investments, primarily in futures contracts, conducted by its employee Nick Leeson, working at its office in Singapore. Barings Bank was founded in 1762 as the John and Francis Baring Company by Francis Baring, with his older brother John Baring as a mostly silent partner. They were sons of John (né Johann) Baring, wool trader of Exeter, born in Bremen, Germany. The company began in offices off Cheapside in London, and within a few years moved to larger quarters in Mincing Lane. Barings gradually diversified from wool into many other commodities, providing financial services for the rapid growth of international trade, including the lucrative slave trade which enriched the family and the business considerably and allowed significant expansion of the bank's activities and prestige. In 1774, Barings started business in the US. By 1790, Barings had greatly expanded its resources, both through Francis' efforts in London and by association with leading Amsterdam bankers Hope & Co. In 1793, the increased business necessitated a move to larger quarters in Devonshire Square. Francis and his family lived upstairs, above the offices. In 1796, the bank helped to finance the purchase of about 1 million acres (4000 km2) of remote land that would become part of the state of Maine. In 1800, John retired and the company was reorganized as Francis Baring and Co. Francis' new partners were his eldest son Thomas (later to be Sir Thomas Baring, 2nd Baronet) and son-in-law, Charles Wall. Then, in 1802, Barings and Hope & Co. were called on to facilitate the largest land purchase in history: the Louisiana Purchase, which doubled the area of the USA. It is regarded as "one of the most historically significant trades of all time". This was accomplished even though Britain was at war with France, and the sale helped to finance Napoleon's war effort. Technically, the United States purchased Louisiana from Barings and Hope, not from Napoleon. Baring was willing to help Napoleon in the short term because he, and British politicians who backed him, predicted that American expansion into Louisiana would, as elsewhere in the USA, result in the extermination of native populations, the importation of Africans as slaves, and the production and export of cotton to the whirring British mills around Manchester. In other words, American slavery would ensure Baring's profits in Britain. After a $3 million down payment in gold, the remainder of the purchase was made in United States bonds, which Napoleon sold to Barings through Hope & Co. of Amsterdam at a price of $87.50 per $100 face value (a discount of one-eighth). Francis' second son Alexander, working for Hope & Co., made the arrangements in Paris with François Barbé-Marbois, Director of the Public Treasury. Alexander then sailed to the United States and back to pick up the bonds and deliver them to France. 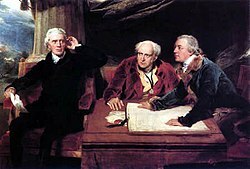 In 1803, Francis began to withdraw from active management, bringing in Thomas' younger brothers Alexander and Henry to become partners in 1804. The new partnership was called Baring Brothers & Co., which it remained until 1890. The offspring of these three brothers became the future generations of Barings leadership. In 1806, the company relocated to 8 Bishopsgate, where they stayed for the remaining life of the company. The building underwent several expansions and refurbishments, and was finally replaced with a new high-rise building in 1981. Barings helped to finance the United States government during the War of 1812. By 1818, Barings was called "the sixth great European power", after England, France, Prussia, Austria and Russia. A fall off in business and some poor leadership in 1820s caused Barings to cede its dominance in the City of London to the rival firm of N M Rothschild & Sons. Barings remained a powerful firm, however, and in the 1830s the leadership of new American partner Joshua Bates, together with Thomas Baring, son of Sir Thomas Baring, 2nd Baronet, began a turnaround. Bates advocated a shift in Barings' efforts from Europe to the Americas, believing that greater opportunity lay in the West. In 1832, a Barings office was established in Liverpool specifically to capitalize on new North American opportunities. In 1843, Barings became exclusive agent to the US government, a position they held until 1871. Barings was next appointed by Sir Robert Peel to supply "Indian corn" (maize) to Ireland for famine relief between November 1845 and July 1846, after the staple potato crop failed. The company declined to act beyond 1846, when the government instructed them to restrict purchases to within the United Kingdom. Baring Brothers refused any commission for work performed in the cause of famine relief. Their position as prime purchasers of Indian corn was assumed by Erichson, a corn factor of Fenchurch St, London. In 1851, Baring and Bates brought in another American, Russell Sturgis as partner. Despite the embarrassment to his partners caused by his sympathies for the South in the American Civil War, Sturgis proved a capable banker. After the death of Bates in 1864, he gradually assumed a leadership role in the firm. In the 1850s and 1860s, commercial credit business provided the firm with its "bread and butter" income. Thomas Baring's nephew Edward, son of Henry Baring, became a partner in 1856. By the 1870s, under the emerging leadership of "Ned" Baring, later the 1st Baron Revelstoke, Barings were increasingly involved in international securities, especially from the United States, Canada, and Argentina. Barings cautiously and successfully ventured into the North American railroad boom following the Civil War. A new railroad town in British Columbia was renamed Revelstoke, in honor of the leading partner of the bank that enabled the completion of the Canadian-Pacific Railway. Barings also helped to finance major railways including Atchison, Topeka and Santa Fe Railway. In 1886, the bank helped broker the listing of the Guinness brewery. Later in the 1880s, daring efforts in underwriting got the firm into serious trouble through overexposure to Argentine and Uruguayan debt. In 1890, Argentine president Miguel Juárez Celman was forced to resign following the Revolución del Parque, and the country was close to defaulting on its debt payments. This crisis finally exposed the vulnerability of Barings, who lacked sufficient reserves to support the Argentine bonds until they got their[whose?] house in order. Through the organisational skills of the governor of the Bank of England, William Lidderdale, a consortium of banks was arranged, headed by former governor Henry Hucks Gibbs and his family firm of Antony Gibbs & Sons, to bail Barings out and support a bank restructuring. The resulting turmoil in financial markets became known as the Panic of 1890. Although the rescue avoided what could have been a worldwide financial collapse, Barings never regained its dominant position. A limited liability company - Baring Brothers & Co., Ltd. - was formed, to which the viable business of the old partnership was transferred. The assets of the old house and several partners were taken over and liquidated to repay the rescue consortium, with guarantees provided by the Bank of England. Lord Revelstoke and others lost their partnerships along with their personal fortunes, which were pledged to support the bank. It was almost ten years before the debts were paid off. Revelstoke did not live to see this accomplished, dying in 1892. Barings did not return to issuance on a substantial scale until 1900, concentrating on securities in the United States and Argentina. Its new, restrained policy, under the leadership of Edward's son John, was considered to have made Barings a more appropriate representative of the British establishment. [clarification needed] The company established ties with King George V, thus beginning a close relationship with the British monarchy that would endure until Barings' collapse in 1995. Diana, Princess of Wales was a great-granddaughter of a Baring. Descendants of five of the branches of the Baring family tree have been elevated to the peerage: Baron Revelstoke, the Earl of Northbrook, Baron Ashburton, Baron Howick of Glendale and the Earl of Cromer. The company's restraint during this period cost it its pre-eminence in the world of finance, but later paid dividends when its refusal to take a chance on financing Germany's recovery from World War I saved it some of the most painful losses incurred by other British banks at the onset of the Great Depression. During the Second World War, the British government used Barings to liquidate assets in the United States and elsewhere to help finance the war effort. After the war, Barings was overtaken in size and influence by other banking houses, but remained an important player in the market until 1995. Barings was brought down in 1995 by a massive trading loss caused by fraudulent trading by its head derivatives trader in Singapore, Nick Leeson. Leeson was supposed to be arbitraging, seeking to profit from differences in the prices of Nikkei 225 futures contracts listed on the Osaka Securities Exchange in Japan and on the Singapore International Monetary Exchange. However, instead of buying on one market and immediately selling on another market for a small profit, the strategy approved by his superiors, Leeson bought on one market then held on to the contract, gambling on the future direction of the Japanese markets. According to Eddie George, Governor of the Bank of England, Leeson began doing this at the end of January 1992. Due to a series of internal and external events, his unhedged losses escalated rapidly. Under Barings Futures Singapore's management structure through 1995, Leeson was not only floor manager for Barings' trading on the Singapore International Monetary Exchange, but also the unit's head of settlement operations. In the latter role, he was charged with ensuring accurate accounting for the unit. These positions would normally have been held by two different employees. By allowing Leeson, as trading floor manager, to settle his own trades, Barings short-circuited normal accounting and internal control/audit safeguards. In effect, Leeson was able to operate with no supervision from London—an arrangement that made it easier for him to hide his losses. After the collapse, several observers, including Leeson himself, placed much of the blame on the bank's own deficient internal control and risk management practices. A number of people had raised concerns over Leeson's activities but were ignored. Because of the absence of oversight, Leeson was able to make seemingly small gambles in the futures arbitrage market at Barings Futures Singapore and cover for his shortfalls by reporting losses as gains to Barings in London. Specifically, Leeson altered the branch's error account, subsequently known by its account number 88888 as the "five-eights account", to prevent the London office from receiving the standard daily reports on trading, price, and status. Leeson claims the losses started when one of his colleagues bought 20 contracts when she should have sold them, costing Barings £20,000. By December 1994, Leeson had cost Barings £200 million. He reported to British tax authorities a £102 million profit. If the company had uncovered his true financial dealings then, collapse might have been avoided as Barings still had £350 million of capital. Using the hidden five-eights account, Leeson began to trade aggressively in futures and options on the Singapore International Monetary Exchange. His decisions routinely resulted in losses of substantial sums, and he used money entrusted to the bank by subsidiaries for use in their own accounts. He falsified trading records in the bank's computer systems, and used money intended for margin payments on other trading. As a result, he appeared to be making substantial profits. However, his luck ran out when the Kobe earthquake sent the Asian financial markets—and with them, Leeson's investments—into a tailspin. Leeson bet on a rapid recovery by the Nikkei, which failed to materialise. "Barings' collapse was due to the unauthorised and ultimately catastrophic activities of, it appears, one individual (Leeson) that went undetected as a consequence of a failure of management and other internal controls of the most basic kind". "as a consequence of a failure of management and other internal controls of the most basic kind". "Management teams have a duty to understand fully the businesses they manage". "Responsibility for each business activity has to be clearly established and communicated". "Clear segregation of duties is fundamental to any effective control system". "Relevant internal controls, including independent risk management, have to be established for all business activities". "Top management and the Audit Committee have to ensure that significant weaknesses, identified to them by internal audit or otherwise, are resolved quickly". Well, well, well! These are all respects which this control body finds were absent from Barings. Do noble Lords really know what is being said? It is being said that Barings ought not to have been authorised bankers from the beginning, because any business — I do not care whether it is a whelk stall (one must not insult whelk stall owners in the context of this catastrophe) or what — knows that these are the basic conditions for the continuance of the business. It seems to me that the Bank of England ought never to have authorised this concern without verifying that all these conditions were in place. ING, a Dutch bank, purchased Barings Bank in 1995 for the nominal sum of £1 and assumed all of Barings' liabilities, forming the subsidiary ING Barings. In 2001, ING sold the U.S.-based operations to ABN Amro for $275 million, and folded the rest of ING Barings into its European banking division. This left only the asset management division, Baring Asset Management. In March 2005, BAM was split and sold by ING to MassMutual, which acquired BAM’s investment management activities and the rights to use the Baring Asset Management name, and Northern Trust, which acquired BAM’s Financial Services Group. Barings Bank therefore no longer has a separate corporate existence, although the Barings name still lived on as the MassMutual subsidiary, Baring Asset Management. In March 2016, a merger was announced with other asset management subsidiaries of MassMutual, creating a new "Barings" headquartered in Charlotte, NC. Baring Private Equity International, which included investment teams in Asia, India, Russia and Latin America was acquired by its respective management teams, which today include Baring Vostok Capital Partners in Russia, GP Investments in Brazil as well as Baring Private Equity Asia, and Baring Private Equity Partners India. With the failure of Barings, N M Rothschild & Sons is the only name remaining from the glory days of 19th-century British merchant banking. After learning of Barings' collapse (and realising he was certain to be jailed for his actions), Leeson booked a flight to London where he intended to surrender to British police in hopes of serving prison time in the United Kingdom as opposed to Singapore. However, he was apprehended by German authorities when he landed in Frankfurt. Leeson spent the next several months in German custody unsuccessfully fighting extradition back to Singapore. British authorities declined to pursue extradition of Leeson back to the United Kingdom. Leeson was eventually sentenced to six and a half years in prison in Singapore, but was released early in 1999 after being diagnosed with colon cancer. Despite grim forecasts at the time, he did not succumb to the disease. On 5 April 2007, The Guardian newspaper reported that KPMG, the liquidators of Barings PLC, had sold a trading jacket thought to have been worn by Nick Leeson while trading on SIMEX in Singapore. The jacket was offered for sale on eBay but it failed to reach its reserve price despite a highest bid of £16,100. It was subsequently sold for £21,000. In October 2007 a similar jacket used by Leeson's team but not thought to have been worn by Leeson himself sold at auction for £4,000. The 1999 film Rogue Trader is a fictionalized account of the bank's downfall based upon Leeson's autobiography Rogue Trader: How I Brought Down Barings Bank and Shook the Financial World. In the film, the bank is repeatedly described as the oldest merchant bank and private bank in the world; this is however inaccurate, as the oldest merchant bank and private bank is Berenberg Bank. In the historical novel Stone's Fall (2009) by Iain Pears, Barings and its role in the Panic of 1890 play a significant part in the story's structure. "As today is Wednesday, the 2nd of October, I shall be due in London in this very room of the Reform Club, on Saturday, the 21st of December, at a quarter before nine p.m.; or else the twenty thousand pounds, now deposited in my name at Barings, will belong to you, in fact and in right, gentlemen. Here is a cheque for the amount." Leonard Ingrams, former Managing Director and founder of Garsington Opera. Rogue Trader 1999 film starring Ewan McGregor. Jérôme Kerviel, trader with Société Générale who lost approximately €4.9 billion. Kweku Adoboli, trader with UBS who lost over USD 2 billion in 2011. Galway United F.C., by whom Nick Leeson, instrumental in Barings' collapse, was subsequently employed. ^ Reason, James (1997). Managing the Risks of Organizational Accidents. Ashgate Publishing Limited. p. 29. ^ a b c Ziegler, Philip (1988). The Sixth Great Power: Barings 1762–1929. London: Collins. ISBN 0-00-217508-8. ^ a b c d e f Aguilera, Kristin. "The British Bank That Forever Altered the U.S. Economy (22 Jan, 2013)". Bloomberg View. Retrieved 26 March 2017. ^ Alberts, Robert C. (1969). The Golden Voyage. Boston: Houghton Mifflin Company. p. 423. ^ Wayne T. De Cesar and Susan Page (Spring 2003). "Jefferson Buys Louisiana Territory, and the Nation Moves Westward". National Archives and Records Administration. ^ Hickey, Donald R. (November 2012). "Small War, Big Consequences: Why 1812 Still Matters". Foreign Affairs. Council on Foreign Relations. Archived from the original on January 16, 2013. Retrieved July 26, 2014. ^ Titcomb, James (23 February 2015). "Barings: the collapse that erased 232 years of history". The Daily Telegraph. Retrieved 27 March 2017. ^ "Barings Bank WW2". Wardsbookofdays. ^ "A Fallen Star". The Economist. 334 (7904). March 4, 1995. pp. 19–21. ^ "Case Study : Barings". Sungard Bancware Erisk. Archived from the original on 17 October 2007. Retrieved 2007-11-18. ^ "Barings debacle". Risk Encyclopedia. Archived from the original on 2014-07-03. ^ a b "Implications of the Barings Collapse for Bank Supervisors" (PDF). Reserve Bank of Australia. 1995. Archived from the original (pdf) on 2007-09-01. Retrieved 2007-11-18. ^ a b Howard Chua-Eoan (2007). "The Collapse of Barings Bank, 1995". TIME magazine. Archived from the original on November 16, 2007. Retrieved 2007-11-18. ^ Reason, James (1997). Managing the Risks of Organizational Accidents. Ashgate Publishing Limited. pp. 28–34. ^ Kapner, Suzanne (2001-01-31). "WORLD BUSINESS BRIEFING: EUROPE; MORE RESTRUCTURING BY ING GROUP". The New York Times. Retrieved 2007-11-26. ^ "Mass Mutual Asset Management Affiliates Announce Plans to Combine". March 2016. ^ "Home". bpeasia.com. 23 August 2015. ^ India, Baring Private Equity Partners. "Baring Private Equity Partners India". www.bpepindia.com. ^ Wearden, Graeme (2007-04-05). "Nick Leeson's jacket raises £21,000". The Guardian. London. Archived from the original on 3 April 2010. Retrieved 2010-04-26. ^ "Distressed investing dinner 2007". July 2016. ^ "Book review: Stone's Fall, by Iain Pears". The Scotsman. 7 May 2009. Retrieved 26 February 2018. Drummond, Helga (2007). The Dynamics of Organizational Collapse: The Case of Barings Bank. London: Routledge. ISBN 978-0-415-39961-6. Fay, Stephen (1997). The Collapse of Barings. New York: W.W. Norton. ISBN 0-393-04055-0. Gapper, John; Denton, Nicholas (1995). All that Glitters: The Fall of Barings. London: Hamish Hamilton. ISBN 0-241-13699-7. Hunt, Luke; Heinrich, Karen (1996). Barings Lost: Nick Leeson and the Collapse of Barings Plc. Singapore: Butterworth-Heinemann Asia. ISBN 981-00-6802-6. Jacque, Laurent L. (2010). Global Derivative Debacles: From Theory to Malpractice. Singapore: World Scientific. ISBN 978-981-283-770-7. Chapter 10: Barings, pp. 143–178. Leeson, Nicholas William; Whitley, Edward (1996). Rogue Trader: How I Brought down Barings Bank and Shook the Financial World. Boston: Little, Brown. ISBN 0-316-51856-5. Mezrich, Ben (2004). Ugly Americans. New York: HarperCollins. ISBN 0-06-057500-X. Rawnsley, Judith H.; Leeson, Nicholas William (1995). Total Risk: Nick Leeson and the Fall of Barings Bank. New York: Harper Business. ISBN 0-88730-781-7. "The Collapse of Barings Bank"